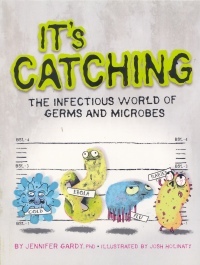 CM Magazine: It's Catching: The Infectious World of Germs and Microbes. It's Catching: The Infectious World of Germs and Microbes. Jennifer Gardy. Illustrated by Josh Holinaty. 64 pp., pbk. & hc., $13.95 (pbk. ), $19.95 (hc.). ISBN 978-1-77147-053-7 (pbk. ), ISBN 978-1-77147-001-8 (hc.). Jennifer Gardy, the author of It's Catching, is a professor of population and public health at the University of British Columbia, a medical microbiologist, a senior scientist at the British Columbia Centre for Disease Control, and, in her own words "a disease detective." This makes her a perfect candidate to write a book for youth that describes the microorganisms that cause disease in living things, particularly people, and she triumphs. The 64 pages of It's Catching are divided into five chapters. These are: "Meet the Microbes", "Germs 101", "Get to know the Great Germs", "Germs and Us - Together Forever", and "Adventures in Public Health". From the introduction to the index, Dr. Gardy, fills each page with fascinating and age-appropriate information. Her intent is not to scare readers about infectious diseases, but to expose them to "the wonderful world of microbes", how and why some microbes - like the "great germs" - make people sick, how microbiologists grow and study microorganisms, the impact of pathogens on the history of civilization and the human genome, and vaccines, antibiotics, and methods used to control or treat infection and disease. Along the way, readers also learn about taxonomy, scientific discoveries, the World Health Organization, superbugs, high security BSL-4 laboratories where scientists study highly contagious diseases, how to prevent food poisoning and giving others your cold, and factors that determine whether a germ will cause a pandemic by playing "The Pandemic Game" found on page 57. In the introduction to "great germs" in Chapter 3, Dr. Gardy tells readers about the almost 2000 infectious diseases the World Health Organization monitors and the global mortality and morbidity rates for these diseases that it annually reports. The great germs are those that are currently listed as being most infectious. These are HIV causing AIDS (2.8 million infected), Dengue fever (9 million infected), measles virus (27.2 million infected), malaria (241.4 million infected), pneumonia (446.8 million infected), and diarrhea (4.6 billion bouts). These are not, however, the nine "great germs" more thoroughly described in the book. Measles and malaria are on Dr. Gardy's list as well as the common cold, influenza, the six most common bacteria causing food poisoning, rabies, the Ebola virus, the cat-loving protozoan parasite that can cause toxoplasmosis, and the bacterium, Heliocobacter pyliri, that causes stomach inflammation and ulcers. Each one of these germs is presented with a trading card of information that includes its scientific name, mode of transmission, symptoms, and danger meter score of 1 to 10 with 10 being the most easily transmissible or most deadly. Rabies, for example, is named "Rabies virus". It is transmitted "through the bite of an infected animal", results in "paralysis; hallucinations; insomnia; agitation" and is rated 10 on the DangerMeter given that the virus in the infected animal's saliva attacks the brain and spinal cord of the bitten animal and is normally fatal if not treated immediately. In addition to this information, Dr. Gardy tells readers about the rabies vaccine developed by Louis Pasteur in 1885 and the case of a Jeanna Giese who was bitten by a bat but did not develop symptoms of rabies until a month had passed. Doctors put her into a six day medically induced coma that shut down her central nervous system, and she lived to become the first know survivor of rabies who had not received injections of the rabies vaccine. Readers also learn a "FACT" about immune Peruvians in the Amazon jungle, and information about countries attempting to eradicate rabies by placing the rabies vaccine in plastic pouches, coated with food crumbs, that are then placed in wilderness areas where potential carriers of the rabies virus live. Each of the remaining eight germs is as richly described, and the written information is perfectly complemented with the amusing illustrations of Josh Holinaty. Rather than using microscopic images as a representative source, Holinaty draws imaginative cartoon-like microbes that often portray the symptoms they create. He also includes eye-catching illustrations of the variety of micro-organisms that live with and on us, Dr. Alexander Fleming's laboratory, virus replication, binary fission, Barry Marshall who drank a liquid culture of H. pylori to show that the bacterium was responsible for stomach inflammation and who won the 2005 Nobel Prize with his colleague, Robin Warren, and the microbe hunters in public health. I suspect that it may be Holinaty's work that catches potential readers' notice, particularly the germ lineup on the cover, but it will be Dr. Gardy's engaging writing style that has readers turning from page to page in wonder and surprise. Who would have imagined that five thousand parvoviruses fit across the width of one human hair, or that the level of influenza in a particular region can be predicted by tracking the number of times people google the word flu, or that the cat loving parasite Toxoplasma gondii rewrites the rat's brain so that it's attracted to cats, or that we live in an era where bacteria are resistant to almost every antibiotic drug created?